Andrew Groover celebrates the complexity of trees, and makes it his life’s work to unlock how they adapt to their environments. It’s knowledge that’s critical for the U.S. Forest Service research geneticist — he works in California, where concerns about climate change have grown as wildfires there have increased in frequency and intensity. A practical problem for Groover, who is a University of California, Davis, adjunct professor of plant biology, is efficient access to the variety of trees he studies. His research requires a ready supply of species diversity, a tall order without laborious travel. But in 2012 his search for the perfect resource brought him to the Arnold Arboretum of Harvard University — a 281-acre living museum holding more than 2,100 woody plant species from around the world. The Arboretum also contains one of the most extensive collections of Asian trees in the world, which Groover said is advantageous to his research. Typically a researcher has to travel to various locations throughout the world, determine whether the trees are on public or private property, obtain permission to study and transport samples, overcome language and other barriers, and potentially return to the same site later to complete research, which can be challenging. Director of the Arnold Arboretum and Arnold Professor of Organismic and Evolutionary Biology William (Ned) Friedman emphasized the extraordinary efforts that go into creating such a high-impact research destination. Groover’s work with the Arboretum became a long-term collaboration. In 2014 he won a Sargent fellowship, and, working with Arboretum scientists, collected small samples of genetic material from specific Arboretum trees and propagated them in his own laboratory greenhouses. In 2015 Groover, with Friedman, organized the 35th New Phytologist Symposium held at the Arboretum. He has also given several research talks there, most recently in December on genomic approaches to understanding the development and evolution of forest trees. Groover’s work investigates genetic regulation of wood formation — the triggers of gene expression within the wood — which is driven by environment, including light, temperature, wind, water, gravity, even insects and disease. Studying diverse tree species helps him identify the genetic basis of how different species modify their growth and adapt to different environmental conditions. Suzanne Gerttula, a research assistant with Andrew Groover, has an interest in the underlying mechanisms of trees’ responses to gravity, such as occurs in weeping varieties. The collaboration with the Arboretum is special because its trees contain valuable provenance. “The trees are well-cared for, are not likely to disappear or die so you can go back again, and they are all right there next to each other,” Groover said. 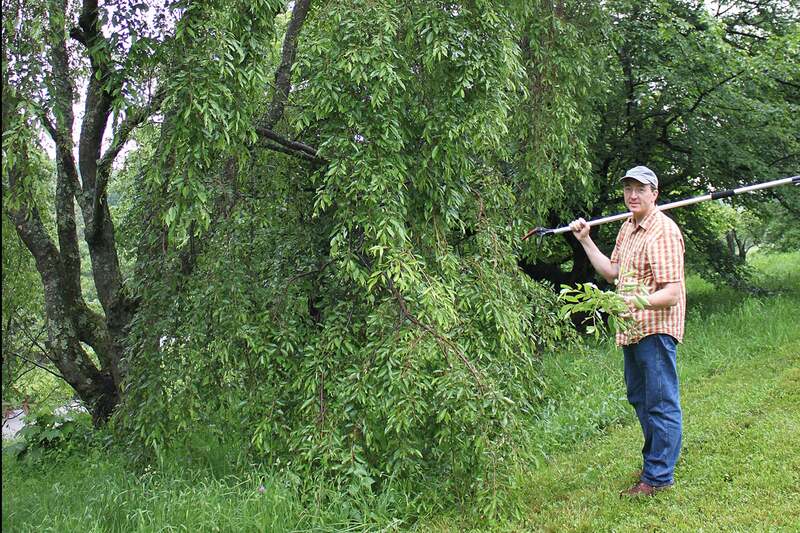 While his in-depth research is on poplars (Populus spp. ), the knowledge obtained may be beneficial in the study of many other tree species. Suzanne Gerttula of the Forest Service began working in developmental plant genetics more than three decades ago and joined Groover’s laboratory in 2010. The former staff research associate in plant biology at U.C., Davis, has an interest in the underlying mechanisms of trees’ responses to gravity, such as occurs in weeping varieties. “The Arboretum is an incredible resource for both weeping and upright trees. It’s fascinating, fun, and inspiring to me to be able to get at the some of the biochemical bases of how life works,” she said. Groover’s enthusiasm for his subject spans sectors from ecological to economic. From understanding Earth cycles and climate change to helping the lumber, paper, fiber, and even biofuel industries, he hopes his research can inform solutions for forest management and conservation and identify new forms of renewable energy. “I think it’s important we have places like the Arnold Arboretum to help provide this sort of basic information that has the potential to help in the conservation and management of forests,” he said. Michael Dosmann, Keeper of the Living Collections at the Arboretum, said it has research potential across a wide swath of disciplines — taxonomic, horticultural, plant conservation, ecology, and developmental biology. Scientists such as Groover enjoy access not only to the living collections, but also to other Arboretum resources, including afﬁliated collections containing herbarium specimens, archives, images, historical records, on-site greenhouse and laboratory space, centralized expertise, and, frequently, financial assistance in the form of grants and fellowships. “All too often, the cost both in time and dollars of assembling collections at their own institutions is prohibitive for researchers, making places like the Arboretum a vital resource, especially for those working with limited budgets,” Dosmann said. Evolving technology also plays a critical role, according to Dosmann, giving researchers the ability to access the Arboretum’s expansive resources, and making plant species more attainable. “With the aid of databases and other information systems, it is now much easier to see collections in the multiple dimensions within which they exist and appreciate their unlimited research potential,” he said. Groover said that with forests facing multiple threats, there’s never been a more important time to address forest biology and the use of technology.